I feel that way sometimes when I’m traveling. I like to observe a little from a distance. I like seeing what I see. I have the assistance of an actual camera to help with the recording. But I try to stay out of the frame. The trip is not about me. It’s about the things I’m seeing. Still, today it was very hard not to take things very personally. This was my first stop this morning. There are several aspects to this museum, but I was unable to be just an observer for any of them. 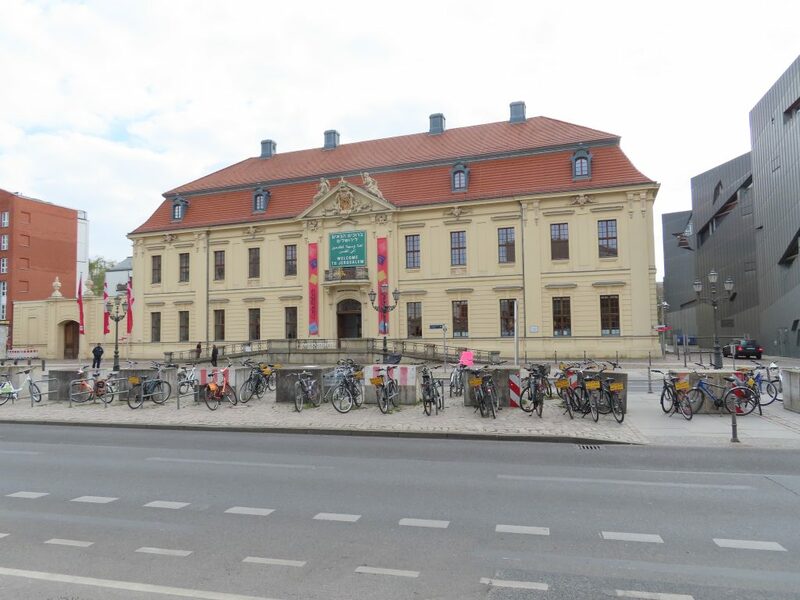 There are two buildings that make up the museum, and this exhibit takes up the old building. Built in 1735, it originally served as the seat of the Royal Court of Justice. 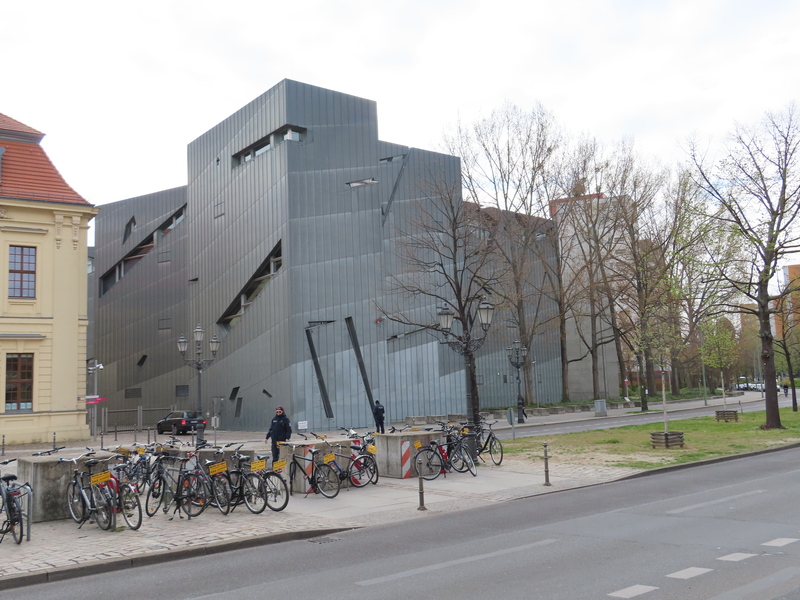 It was almost completely destroyed during World War II, was rebuilt in the 1960s to house the Berlin Museum and remodeled in the 1990s, when it became the home of the Jewish Museum. To the present day, Jerusalem remains a place of spiritual longing for Jews, Christians, and Muslims around the world. Nowhere else are politics, religion, and urban history so tightly interwoven as here. The exhibit provides a historical look at the city of Jerusalem from ancient to modern times, as a place associated with some of the holiest events in the three main western religions. One room tells about the creation of hotels in the 1920s and 1930s to support the rise of tourism. Another room addressed the declaration of the state of Israel and the partitioning of Palestine to create it. But the part that affected me most was a series of video presentations showing the lives of residents today. I was able to get a first‐hand perspective of what it is like to live in Jerusalem. I heard from an author who survived the suicide bombing of a bus. A young Arab boy who likes to fly kites on the Palestinian side shared his frustration when they crash on the other side of the wall, and the Israeli soldiers fly them. A 90‐year‐old who escaped Berlin before the war told how she never saw her parents again. A 40‐something Muslim who wants to pray at the Al‐Aqsa mosque is not allowed to visit the old city of Jerusalem. And on and on the stories go. I struggle, as a Jew, with the idea that a Jewish homeland was created in a place where Palestinians were living for hundred of years, displacing them and claiming their land. I understand why the Arab nations fought to keep their homes and to show support of their brothers and sisters. It is nonsensical to assert that some book written thousands of years ago gave the Jews the right to go back there and lay claim to that land as their historical homeland. I understand that in the years leading up to World War II, and especially in the aftermath, there was a “Jewish problem” that required a resolution. Did the Jewish people in the twentieth century have a right to a religious or cultural home? And if so, where should it have been? These are complicated questions. I don’t know the answers. But I do know that asking these questions, or questions about the current policy of the Israeli government with regard to the Palestinian people, is not Antisemitism. If it is, then it is also anti‐American to question or criticize our nation’s policies. Israel is there, and it’s not likely to go away. So it no longer makes sense to argue against Israel’s right to exist. It does exist. The question I ask is how Israel and Palestine should coexist. I don’t believe the status quo is acceptable. I am in favor of a two‐state solution. Today, coincidentally, it appears Benjamin Netanyahu is on his way to reelection as Prime Minister of Israel. So I don’t think anything is going to change. Seeing and hearing these various stories made me sad. Over the course of history, religion has caused so much conflict. Many who question how people today can foment terror in the name of God belong to religions that until recently were doing the same. Is there an end to this cycle? 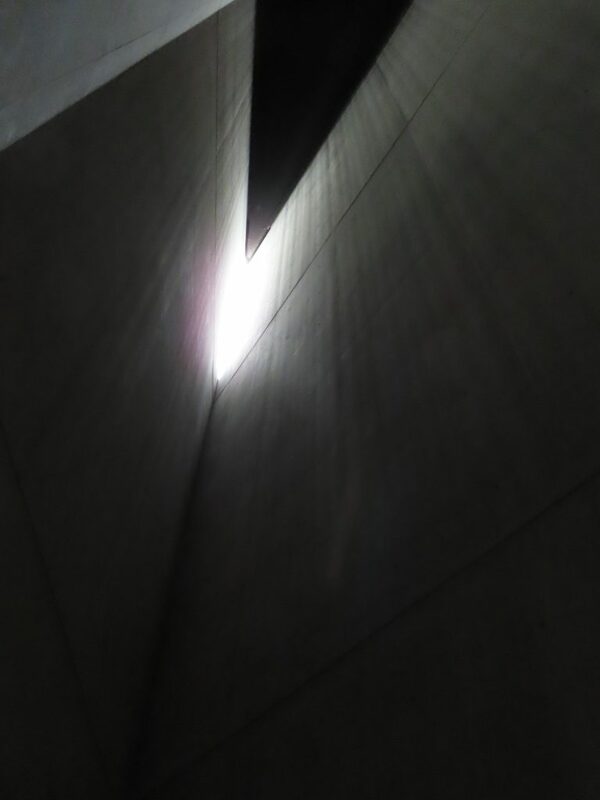 Daniel Libeskind designed the floor plan based on two lines: the building’s visible zigzagging line and an invisible straight line. At the points where the two lines intersect are the “voids,” empty spaces that cut through the building from the basement to the roof. The crisscrossing, oblique slashes of windows appear unsystematic and make it impossible to distinguish the individual floors from outside. There are a number of architectural features that are deeply symbolic. The voids include something the Memory Void, which contains the installation “Fallen Leaves,” dedicated to the victims of war and violence. 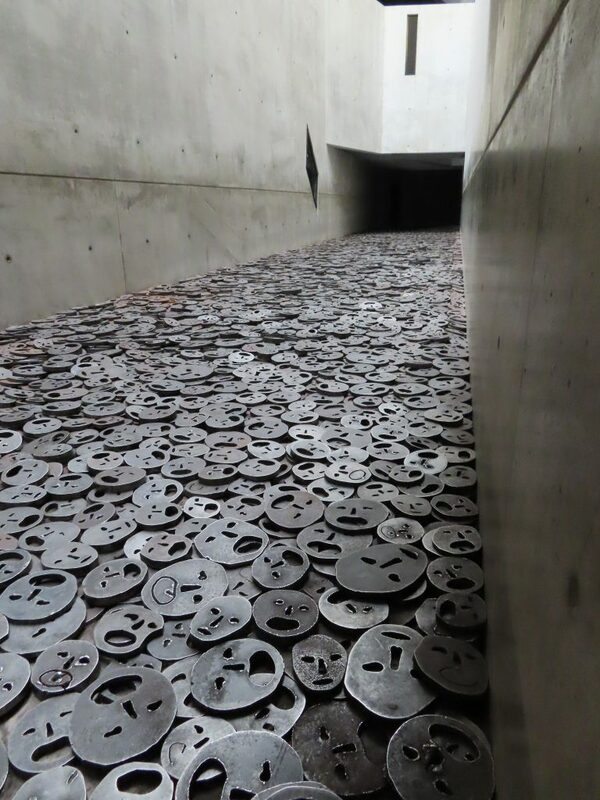 The Israeli artist is Menashe Kadishman; the work consists of 10,000 heavy iron plates cut to resemble faces. The other void is called the Holocaust Tower. It is truly void. And there are three axes. The Axis of the Holocaust portrays the horrors of Nazi persecution and murder of Jews. The Axis of Exile depicts the stories of those Jews who escaped to strange new places and uncertain futures. These two axes have exhibits showing saved and recovered personal artifacts, letters, and photographs. The third axis is the Axis of Continuity. 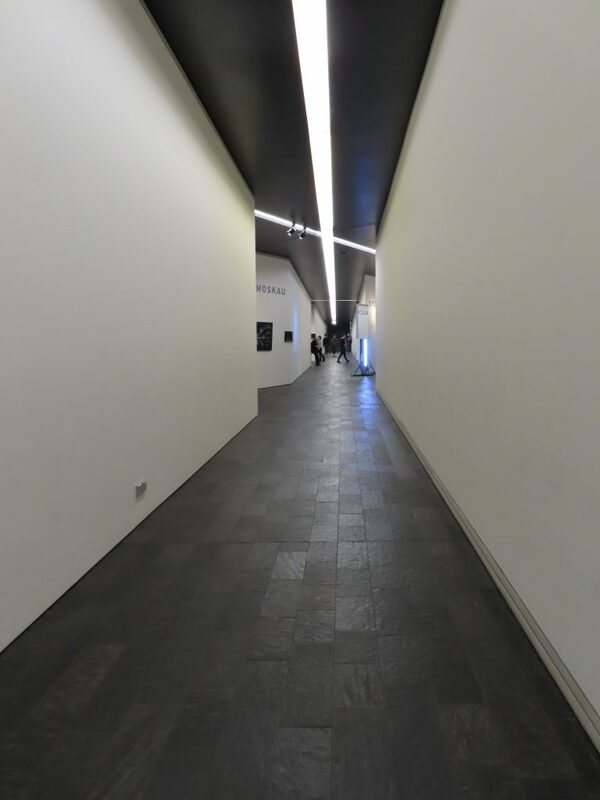 It contains no exhibits and leads up a long staircase toward a blank wall, indicating a future that is undefined. I wrote about how the names of Holocaust victims on the walls of the Pinkas Synagogue in Prague transformed the mass of humanity into nearly 80,000 individual identities. The displays in this museum are truly and deeply personal. A mother sends a letter to her son, hoping she will see him again soon; two years later she is killed at Auschwitz. A family is photographed lighting Sabbath candles. Years later this photograph is used to reunite the survivors in this family with the silver candlesticks that were looted by the Nazis. A family is photographed on their arrival at Terezin, smiling. They write to their former neighbors that they have arrived safely and that the baby traveled well. After a few years, they were sent to Auschwitz; only the father survived. The walls and floors and ceilings in the axes are not level and parallel. This lends a sense of disquiet, of imbalance, to the display. It (or the displays themselves) made me a little sick to my stomach. From the Jewish Museum I walked to a site called Topography of Terror. 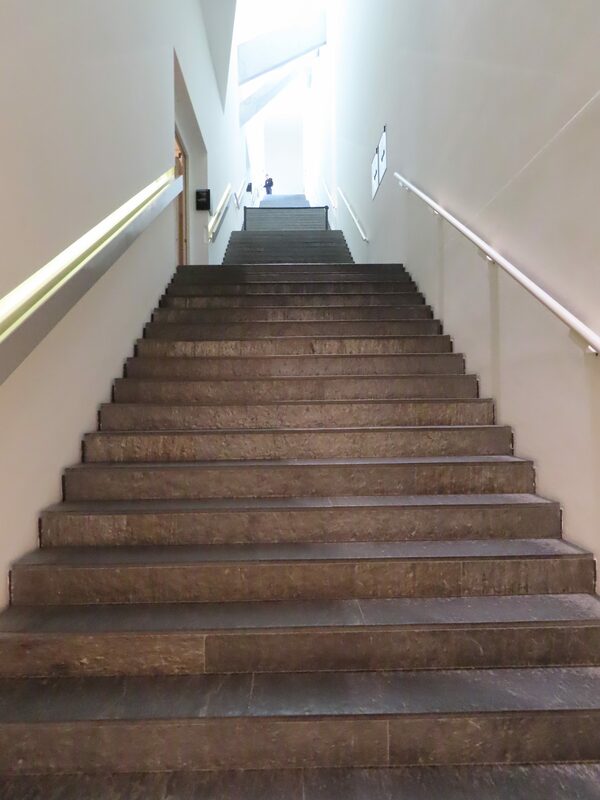 Built at the center of the area where the Gestapo and the SS ran things, this museum provides a chronological display of Hitler’s rise to power, the heinous policies carried out by Himmler and police force, and, ultimately, their defeat and the end of the war. The story is told in hundreds of photographs and documents. Even knowing these stories, seeing this was just overwhelming. I had to move through quickly, but I couldn’t help myself from lingering over a few photos. The workers from Auschwitz, men and women, at a retreat a few miles away laughing cheerfully and mugging for the camera. The women with their heads shaved being paraded through the streets because they fraternized with Polish prisoners. The Jewish families being rounded up from their homes in small villages. This was a tough read. I saw I Am a Camera 100 years ago with Julie Harris and William Prince. It was indeed difficult and heartbreaking to read. I am thinking of you everyday, dear Lane.